As the red baron wrote last weekend, there is not only one path to creating a champion—sure, the Cardinals would be a better team if they acquired a behemoth offensive threat such as Giancarlo Stanton, but this does not mean that onlyacquiring Giancarlo Stanton is a worthwhile move. Of course, the Cardinals know this, and while I assume they (as well as at least a dozen, and probably more) have at least informally inquired about the Miami Marlins right fielder, it is unlikely that they, or any specific team, will acquire him. Which means the Cardinals would consider various backup options. Which means the Cardinals would consider Eric Hosmer. 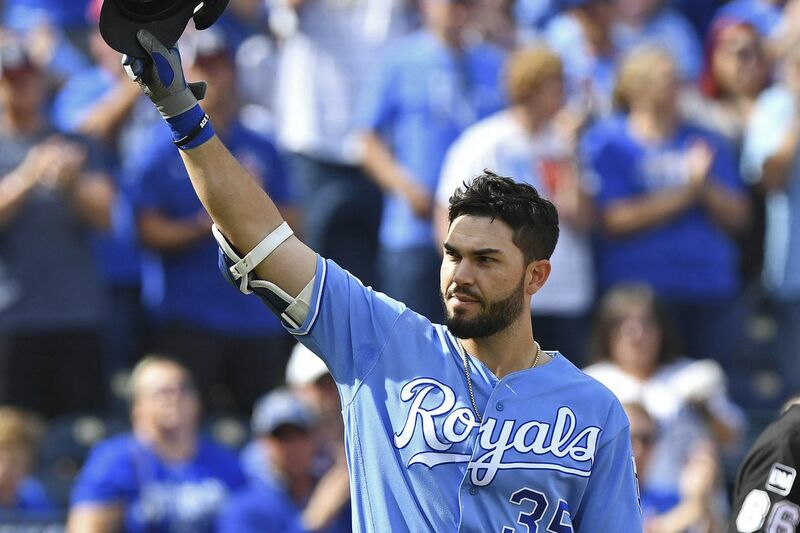 For those of you who are unfamiliar with Eric Hosmer, here are some basic facts: Hosmer will turn 28 next week, which will make him relatively young for a free agent—he was 21 during his rookie season with the Kansas City Royals, the team for whom he has played his entire career. Hosmer has started 1,012 games in the field in his career—1,009 of those games have been at first base, while the other three were in right field (two in 2012, one in 2013). Hosmer has been an above-average hitter in five of his seven MLB seasons, and 2017 was his best season yet—he had a wRC+ of 135, meaning he was 35% above league-average at the plate, and he did this while playing in all 162 games for the Royals. All of these signs point to Eric Hosmer being a good player. In addition to missing zero games in 2017, Hosmer missed just eight total games between 2015 and 2016. And he’s coming off a season in which he trailed only Joey Votto, Paul Goldschmidt, and Freddie Freeman among full-time first basemen in FanGraphs Wins Above Replacement. On the surface, it seems that Eric Hosmer could be a stabilizing force for the Cardinals offense, and if stability is the key for a potential Cardinals free agent acquisition, he would be a fine pick-up. But stability, adequacy, competence, whatever phrase you want to use, is something the Cardinals have in droves. Signing Eric Hosmer is the logical extension of the big free agent signings of the previous two Cardinals off-seasons—average to slightly above-average starting pitcher Mike Leake and average to slightly above-average center fielder Dexter Fowler. There is nothing wrong with Eric Hosmer, and there was nothing inherently wrong with Leake nor Fowler, but signing him would represent very marginal improvement for a team that could be better improved elsewhere. The most strikingly positive thing about Eric Hosmer is that he is coming off of his best season—yes, this probably means that whatever team signs him is buying high, which will drive up his cost, but in a vacuum, one would prefer a player have been good last season as opposed to several seasons ago. Among baseball’s 144 qualified hitters in 2017, players who accumulated enough plate appearances to qualify for the batting title, Hosmer ranked 25th. Only one qualified Cardinals hitter, Tommy Pham, produced a higher wRC+ than Hosmer’s 135 mark. In fact, Pham was the only player with multiple plate appearances (hi Marco Gonzales and his 462 wRC+!) to surpass Hosmer’s plate prowess. But Hosmer did equal another Cardinal, and it is a Cardinal currently under consideration for the first base job in 2018—late-bloomer Jose Martinez. To be clear, Hosmer projects better going forward than Martinez—while each had a career year in 2017, Hosmer was a high draft pick, a well-regarded prospect, has a Major League track record, and is surprisingly over a year younger than Jose Martinez. But there is reason to believe the gap may be closer than one might initially assume—while the two were nearly indistinguishable by wOBA (Martinez was at .379 while Hosmer was at .376), it is Martinez whose xwOBA, a more predictive measurement of hitting ability about which I’ve already written, suggests he was actually unlucky in 2017. Jose Martinez’s xwOBA of .423 equaled that of Mike Trout and trailed only Aaron Judge and Joey Votto among MLB regulars. Meanwhile, the xwOBA of Eric Hosmer stood at .353, tied for 60th among players with at least 75 plate appearances along with Avisail Garcia, Justin Upton, and Lucas Duda. This is, even if it is still lower than his 2017 wOBA, still a perfectly good mark—it puts him on par with Francisco Lindor (considering how much of Lindor’s value comes from base running and elite shortstop defense, this isn’t quite as exciting as it looks at first glance) and Jake Lamb (which probably sounds about as impressive as it actually is). It just becomes that much more difficult to justify what Scott Boras is hyping could be a $200 million payday for Hosmer. While the $200 million mark may be a bit ambitious, he will not be cheap—over $100 million is expected to be the baseline. And while there is probably a better chance of Jose Martinez crashing down to Earth in 2018, there is little reason to believe that Eric Hosmer will improve beyond his 2017 performance. And, of course, comparing Hosmer to Martinez ignores the fact that Matt Carpenterstill exists. Matt Carpenter was also superior to Eric Hosmer by xwOBA in 2017. Matt Carpenter became a full-time MLB player in 2012, and 2017 was the first season in which Eric Hosmer had a higher wOBA than he did. Hosmer has a more distinguished defensive reputation, having won three straight Gold Gloves from 2013 through 2015, but the two were nearly indistinguishable by Ultimate Zone Rating last season—Hosmer scored less than a run better, while Carpenter held a larger edge in Defensive Runs Saved (a metric I hold in less esteem, but which is a nonzero consideration). Even going back to Hosmer’s Gold Glove seasons, his defensive metrics were not quite as sparkling as one might expect. Of the nineteen qualified first basemen in 2013, Hosmer’s top season by UZR, he ranked a very pedestrian 11th in the measurement. Perfectly acceptable, sure, but a look into Hosmer’s numbers beyond being a World Series champion (Ted Williams and Barry Bonds are better players than Corey Patterson) or being an All-Star (how soon we forget the curious case of Omar Infante?) reveals that he is, well, perfectly acceptable. And also perfectly replaceable. The problem with Eric Hosmer isn’t that he isn’t good—it’s that he isn’t great. For a team with a black hole at first base—the Boston Red Sox and Colorado Rockies made the playoffs with marginal options Mitch Moreland and Mark Reynolds, respectively, at the position—he could be extremely useful, in the way that Jhonny Peralta was useful for the Cardinals in 2014 not just because he was good, but because he was replacing Pete Kozma. But the Cardinals are fine at first base, even if they’re still a far cry from Albert Pujols at the position. But if the next great Cardinals first baseman were to come around, the Cardinals are in a position where they could accommodate him—Matt Carpenter could switch positions, Jose Martinez can adopt a bench role, and both players have some trade value. But if the Cardinals signed Eric Hosmer, they would be stuck paying an at-best slightly better option who can only play first base. Unless something dramatic happens to Hosmer’s free agent market, the Cardinals should avoid him.